The most important spring maintenance items for a gas-powered lawnmower are the things you’re actually supposed to do in fall, before you store the mower for the winter. This is when you should empty the gas tank and carburetor by running the mower until it quits and when you should change the oil and clean the underside of the mower deck. With those jobs done, you have only the standard spring checklist tasks listed below (congratulations—you get to skip the section on fall maintenance). Leaving unconditioned gas in a small engine for the winter is the most common cause of failed starts come springtime. All gasoline contains additives that, if allowed to sit, can gum-up and clog the tiny ports and moving parts in a carburetor, while alcohol-blended fuels (such as ethanol) can corrode metal parts. That’s why it’s critical to empty the gas from your mower at the end of the season, or you can add fuel stabilizer to the gas tank (as directed) and run the engine for a while to let it circulate before storing the mower. If you didn’t do those things, siphon out as much of the old gas as possible, add a little fresh gas and try to start the engine (after checking the oil level). If the mower runs, use up all the gas in the tank, then change the oil. If it won’t start, you’ve got a repair issue (tell the repair person that you left the gas in since fall). Here are the basic things to check before starting up your push (non-riding) mower for the season. 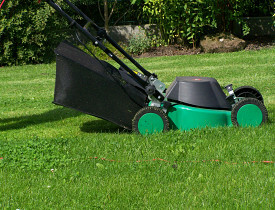 Consult your owner’s manual for maintenance items specific to your lawnmower model. Confirm beer levels in fridge (optional but recommended). If you’ve gone green (or just old school) and use a reel mower—the kind without a smoke-belching engine—spring comes with the sanctimonious pleasure of not having to worry about whether your mower will start. The maintenance duties are much lighter, too. On the downside, if you’ve procrastinated and your grass has gotten long, you’ll probably have to borrow your neighbor’s gas-powered mower for the first lawn mowing of the season. For those who are new to reel mowers, you should know that these environmentally friendly retro machines are also friendly to long grass, so much so that they refuse to cut it. Therefore, the most important spring maintenance item for a reel mower is to cut the grass while it’s still a manageable length. Before you make the first cut, clean and lube the blades, cutting wheel axle and wheels with light engine oil (such as WD-40). Carefully adjust the cutting bar so the blades graze it evenly all the way across, making a nice “scissor” noise. Cut a sheet of paper to test and fine-tune the blade adjustment. Philip Schmidt is a Networx writer. Read more articles like this one or get help with your home projects on Networx.com.